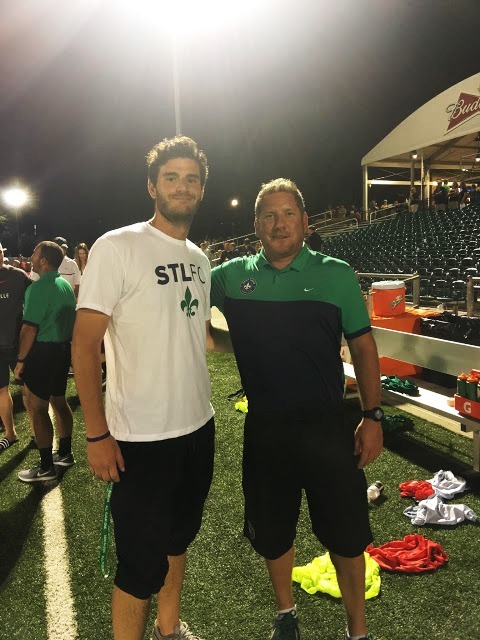 For the past two months I have been gaining clinical experience at Saint Louis FC, the professional soccer club based in Fenton, MO. It has been an incredible experience to work with both the high level athletes and the Mercy Sports Medicine Team that provides coverage to the them. Brian Bounds, ATC, the club's Head Athletic Trainer and my preceptor, has been working with soccer at all levels for over a decade. After earning a bachelors’ degree in kinesiology from Michigan State and a masters in Physical Therapy from Missouri State, Bounds founded a youth soccer camp before leaving to work with the Kansas City Wizards (now Sporting KC) of the MLS. He has also worked with collegiate soccer at Northwestern University and Missouri State, and most recently at Indian Hills Community College where he built their athletic training program from the ground up. On a daily basis, Bounds and I go through a variety of treatments with the athletes, from massage and soft tissue mobilizations to ultrasound and e-stim. That being said, Bounds places a great deal of emphasis on manual therapies and getting ‘hands on’ with the athletes, which has allowed me to further my knowledge and skillset in this area. I have also become responsible for a lot of communication between the medical staff, coaching staff, the other interns, and the players. At first this was quite daunting, but as the summer has gone along I have become incredibly appreciative for the opportunity to practice my professional communication skills. Furthermore, because the medical coverage is provided through Mercy Sports Medicine, I have been able to work with a vast range of health professionals in my time with the club, including orthopedic surgeons, chiropractors, physical therapists, and our CSCS. Overall, this has been an incredibly rewarding summer field experience. Having the ability to work with a new club, with young guys, and an incredibly experienced AT has really challenged me to grow and advance my own knowledge and abilities. I look forward to finishing out the summer strong!